Wow, my last post was August 4th! Summer just flew by this year. Most likely because August for us was filled with a 3 week visit from my mother in law. It was her first time ever stepping foot outside of Mexico. She absolutely loved Canada! We spent lots of time taking in the sights of Vancouver as well as a move to a new apartment during the last week. We only moved across the hall which I thought would be a breeze. Wrong! It took 4 days to move everything, set it up in our new space and clean the old one. My thoughts are not much into crafting at the moment but on where to hang all my pictures and various "stuff" I've collected over the years. 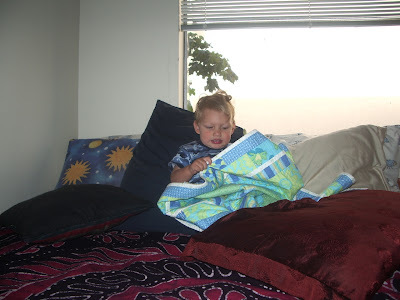 Today I'm posting a photo of my friend's son with his frog quilt! He really loves it and I hope it becomes his favorite "blankie". I can't wait to make more. I've got a big enough fabric stash to jump right in any time....unfortunately it will have to wait until I recover my sofa. First things first! My mother in law is an amazing knitter. I had great plans to learn how to crochet granny squares while she was here but we just ran out of time....I'm still trying to figure out how to make basic loops. Oh well, at least I can sew just about anything! What colour of Orange are you?